Today a neighbor and I were walking on 8th Avenue and we stopped to pick up some greens. Looking at the pears, and scoffing at the THREE layers of foam and plastic wrapped around them, we saw the stickers that announced their origin: China. Well, no wonder they needed all those layers; they had already traveled the world! This summer, thanks to a dedicated group of Sunset Park residents, there is another option. 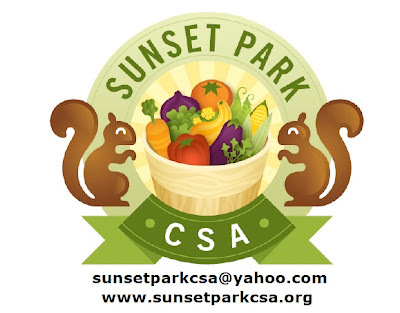 The inaugural season of the Sunset Park Community Supported Agriculture, or CSA, is currently signing up members. Both full and half-shares are available. Pick-up will be Wednesdays from 5 PM to 7:30 PM at St. Michael's on 4th Avenue and 43rd. The shares run from the end of June through October for a total of 20 weeks. There is four hour volunteer commitment involved. It's a great way to get to know your neighbors! A full share for households making over 30K costs $525, households under 30K pay $375. A half-share (every other week) for households making over 30K costs $270, households under 30K pay $195. For more information, email SunsetParkCSA@yahoo.com, or leave questions here in the comment section.